The Maryland State Senate races in Districts 12 and 13 are relatively quiet in terms of signs, especially since none of the candidates have opposition in the primary: Incumbent Ed Kasemeyer is unopposed in the Democratic primary in District 12, and will run against Republican Jesse Pippy in the general election. In District 13 Democrat Guy Guzzone will face off against Republican Jody Venkatesan to win the seat being vacated by retiring Senator Jim Robey. Here are the signs, in alphabetical order by candidate, along with my comments, according to the criteria I’ve previously discussed. Note that I couldn’t find any signs for Jody Venkatesan. Team 13 slate of Democratic candidates for the Maryland House of Delegates and Maryland State Senate, District 13 (large sign). Hey, haven’t I seen this sign before? 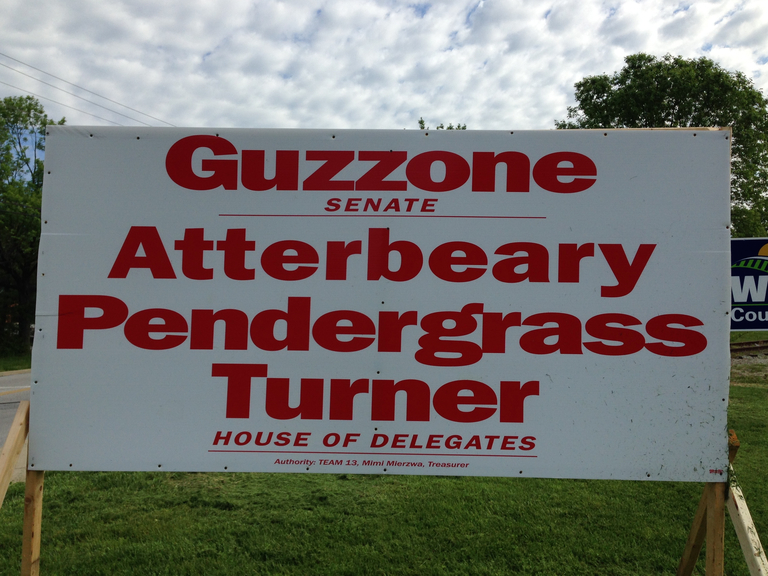 Yes, it’s Team 13 once again, with Guy Guzzone apparently not having any signs just for himself. As I wrote before, this sign is effective but otherwise lacks interest. 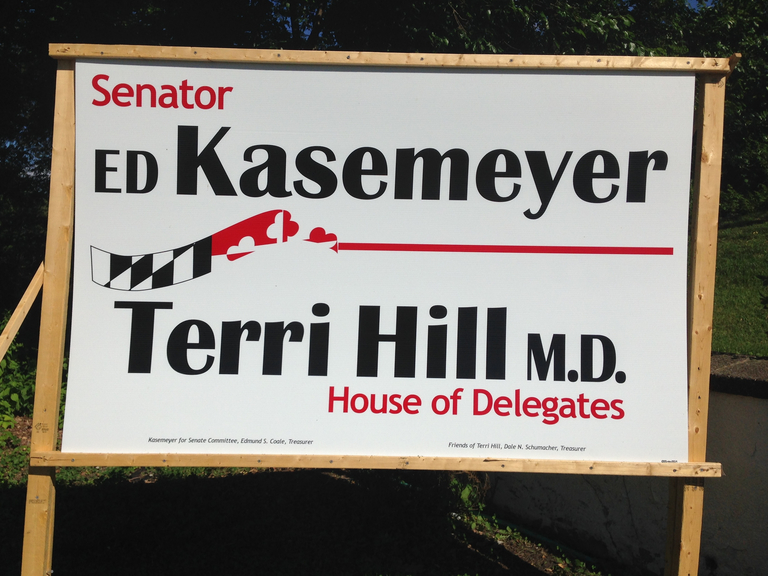 Terri Hill and Ed Kasemeyer, Democratic candidates for the Maryland House of Delegates and Maryland Senate respectively, District 12 (large sign). Another sign we’ve seen before, as Ed Kasemeyer piggybacks on Terri Hill’s sign design. Again I’ve noted the problems I have with this sign, including the somewhat overly idiosyncratic typeface and the botched banner. 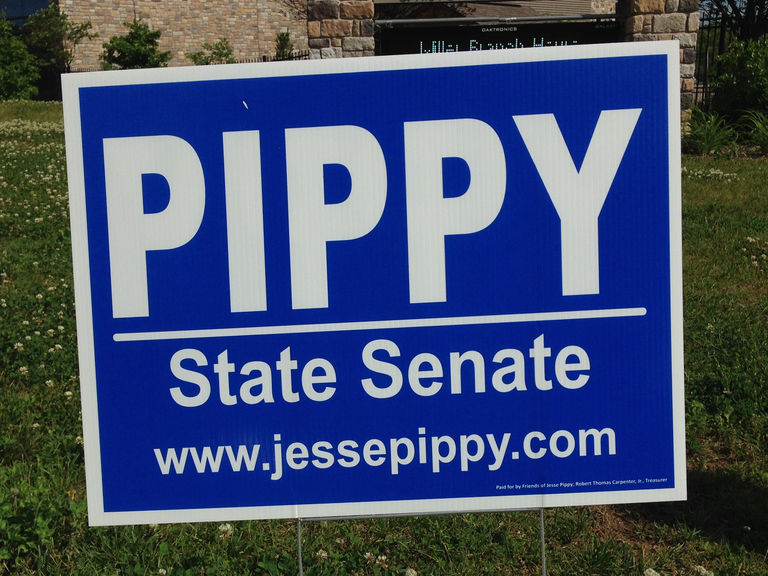 Jesse Pippy, Republican candidate for the Maryland State Senate, District 12 (small sign). A simple sign that gets straight to the point and drives it home without any missteps along the way: candidate’s last name, position sought, and web site address for those wanting to know more. The final tally? I’m going to give this one to Jesse Pippy, first for actually having a sign of his own and second for having it be a simple but nice one. In my next post I’ll come back to Howard County local races and evaluate signs for the Board of Education candidates.